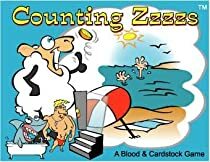 Counting Zzzzs is a surreal new card game for 2-4 people. You and the other players are trying to get a good night’s sleep. That means getting some good REM time in. During REM you will dream, and who knows what dreams may come? Some dreams are good, some bad, and some merely help you clear your head for the new day. Try to assemble a pleasant dream while your opponents try to give you nightmares or wake you up. It’s the most fun you can have in your sleep!